– Worsted weight yarn in brown and gray. I used Lion Brand Vanna’s Choice. – Bulky weight yarn in cream or white. I used Lion Brand Wool Ease Thick & Quick in Fisherman color. Earflap 2:See my PUPPY HAT PATTERN if you need help on where to place the second earflap. With bulky weight yarn, attach yarn and SC around the entire bottom edge of the hat (including earflaps). Fasten off and weave in ends. Row 23: SC dec, SC in next 2, SC dec, ch 1, fasten off weave in ends. Attach Bulky weight yarn and SC around the edge of entire goggle, fasten off and weave in ends. Now you will want to Surface Slip Stitch the circles to make the “eye holes.” Surface slip stitch along the the same place as your single crochets that were made around the edge of the goggles. Sew the goggles on to the front of the hat. With your tapestry needle, sew just under the top of the SC stitches around the edge of your goggles. Attach bulky yarn one more time to make the “strap.” Begin in the middle edge on one side of the goggles and surface slip stitch around the hat the other side of the goggles. Follow along one row of DC’s to make sure your line is consistent. Now you are ready to take flight! Thanks so much. This is just precious!! Wow! Thank you so much for sharing the pattern. I have wanted this pattern for a long time. Bless you. I have a free women's hat pattern, that is great for any age and also for cancer patience that I would love to share with you if you don't mind me posting the link on here. Please let me know. THANK YOU! You are so very talented and generously kind to share! The world could use more souls like yours! I can't wait to make this for the kids at the UNMC's Radiation & Oncology Dept.! thank you for sharing! expecting a grandson soon. will certainly make one for him! tooooo cute. Hugs. She is so very cute and what a great hat! Seriously Sarah, these are professional photos. You should give baby photography a try. Then again, your little model is so darling. Also, I must say, I love the hat. But that jacket, that adorable jacket, did you made that too? I mean, really, is there anything you can't do!! I know you made that airplain. I look forward to your emails and share them with my husband. He likes your slow cooker recipies. You are awesome. Thanks. Hi Barbara, the Minion hat is worked in HDC and this hat is DC. So you don't need as many rows to achieve the length. Thanks for the compliments! Glad you are enjoying my patterns! This hat is so ADORABLE! Thank you so much for it being free, too. Your little man is looking adorable with this gorgeous pilot cap. Thanks for the pattern. Adorable Sarah !!! Gotta make one for my step grandson. I love it. I best start flying those stitches together. Many thanks for sharing. So stinkin' cute! The hat.. baby.. airplane! Love it all! So many great things going on here. First of all, that hat! Cutest aviator hat ever. And those baby cheeks! And that airplane!! Man, you are killing me. Too, too cute. If you had a second to come by and link up at The Makers link party over on my blog, that would be so great! Always love your patterns! They are easy to understand and everyone they are gifted to love the finish gift! How adorable! I love the sweet baby and it's fun aeroplane! Thanks for sharing! Sarah, can u please let me know the color name of the brown and grey u used? The reason I am asking is I bought a grey and brown of Vanna's choice yarn but I'm not sure if I got the right color's………. This is the cutest! Thanks for have many different sizes! Gosh, she's so cute and that hat is perfect! This is great and that bay is so adorable!! Great photo shoot!!! This is adorable. Thanks for the pattern (especially in the varying sizes)!. I made one for my nephew's 2nd birthday, it turned out great! I had some extra white yarn that is bubbly/varying thickness, sort of like Lion Brand's "homespun" yarns.. I used that on the bottom edge and it looks even more like a woolly "lambskin" lining! This is absolutely adorable!! You are so very talented, I thank you for sharing your awesome skills with us!! I have just finished the hat and it is amazing. You are the best Sarah. Thank you very much. Thanks for pattern but I am having trouble finding the brown yarn. .only chocolate or taupe. .. Thank you for this pattern. I've made it for a little boy. Can't wait to try it on. I LOVE THIS SO MUCH! Thanks for sharing! Just made this for my 6 month old daughter! Such a sweet piece of work. Thank you so very much for sharing it. I have made others caps of yours and they are all so lovely. your patterns are the best out there, I swear..! Thanks a lot for sharing.All the best to you and your family. No puedes poner un tutorial al en video con el paso a paso? 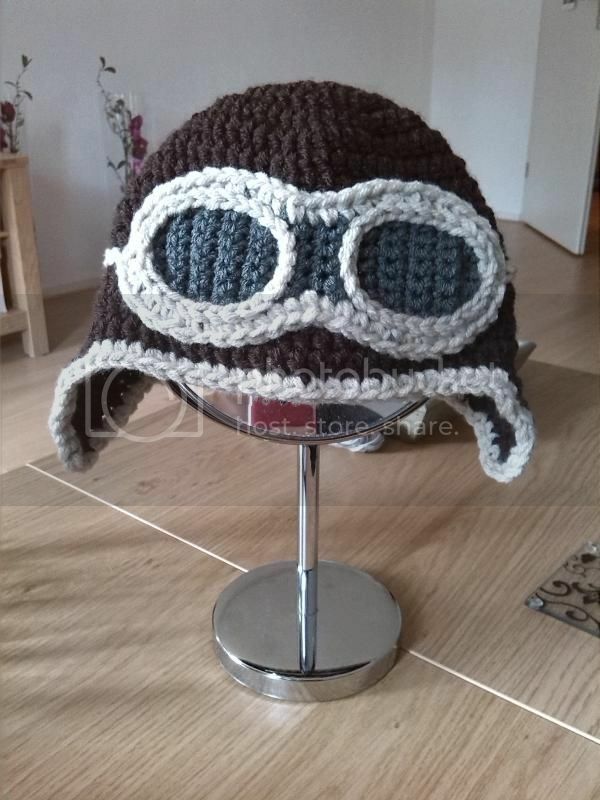 Thank you for this pattern, I’m so excited to make this for my friend’s newborn especially since she is a pilot. I am wondering about sewing the goggles onto the hat. You say to use a tapestry needle, but I’m wondering if I should be using thread or yarn. I assumed yarn given that it’s a tapestry needle, but do you use the bulky cream colored yarn to sew it, or a different type of yarn? Thanks so much, I just need to sew the goggles on and then will be done! I love, love, love the aviator pattern, Thank you so much for sharing your talent. Squeee! I’m about 75% the way through with this pattern and I’m loving it! Your designs are always my favorite baby crochet items. Thanks so much! Can you provide me with a sample gauge swatch (number of stitches and size in inches of a practice swatch) ? I would like to convert this pattern to sport weight yarn rather than worsted weight, so I’m trying to do some math for the conversion. Thanks! Have you converted this pattern to sport weight? I want to make it for someone’s baby, but they live in a hot climate. I am on my last row (row 15) and my hat seems really short. Any ideas? I don’t know if I should maybe keep going or go onto the ear flaps. Please help. Thank you so much for sharing this adorable pattern. I’ve just finished the 9 to 12months and now hoping it will fit the baby. ..fingers crossed. I love this hat!!! A quick question since this is my first hat. Is the chain 2 at the start of each round counted as a double crochet? I know that is what usually is done when crocheting but the pattern doesn’t state this. Thanks and your baby is adorable. This is so cute. How much brown yarn do I need for the 9-12 month hat? Hi! I have a quick question…I have an issue with gauge. My gauge is ALWAYS off. I don’t see a gauge measurement on this pattern. Would it be the same as the puppy dog hat? 7 dc & 4 rows should equal 2″‘s? Thanks so much! Can you explain a little more about sewing on with the tapestry needle? Are you using the bulky yarn to sew it on? Really beautiful work! Thank you for sharing your talent. I am very new to crocheting and don’t understand what you mean by “magic ring” Can you explain. I have odds and parts of balls of wool I would like to use up with these hat patterns, do you think that will work? I want to donate them when I’m done. Hi there I’ve tried the pattern and my hat turns out to be pointy. Any idea is it because of the wool I used? I can not wait to make this hat for my son. I absolutely love the design and how well the patterns are listed – AND that you included all sizes! Thank you! Super cute! Love it. Thank you for sharing your pattern. Hi, I love this pattern! I made it for 6 month old and it was perfect. I’m now trying to do this for my husband, and it turned out way too big. Any suggestions? Go down a size on my needle? Thanks! Thank you for the cute pattern. I’m not sure why but the thick yarn makes the mask n the hat squiggly? Do you know what head circumference your hats fit ? Like for 6-9 months what head circumference does it fit? i love your all pattern! everything is sooooo cute! so could i sell and teach hats using your pattern in Japan? Thank you, Thank you for your great patterns – I crochet over 100 hats a year for charity and I get such great feedback from the hats you design. You are such a special person. What is the gauge? I made the adult size for my son, who has a large head, and it was huge. Thank you so much for your beautiful pattern. I made the hat in the child size, but the goggles seem to be small for the hat. Is there anything you could recommend? Just finished this hat for my 6m old daughter. Now planning on making some for my nieces. It’s so adorable! Thanks so much for sharing. Hi. I’m trying to do this pattern at the moment following teen/adult size, but it turned out only fir on my 11 years old daughter (who has small head) . I’m using 5mm hook. Do you have any suggestion if I want to malke a bigger size? Hello! I just wanted to thank you for the inspiration of your “aviator hat” pattern … Our little Amelia is soooo cute with it ! And I made one for her Daddy who is a pilot . I think I will make a new one to my granddaughter as she grows ! Magic ring… Help! So the link says your pattern tells you what to do but I don’t see that. How do you form the magic ring? I have a question.. I also bought Vanna’s choice in brown but I am not sure the ww is right.. Can you tell me the weight of yarn you used in the brown and grey? Please answer soon I need this by this week or next…I am trying to crochet a baby beanie and I don’t think I have the right yarn. I made one but added straps hanging down. Love it on my grandson!